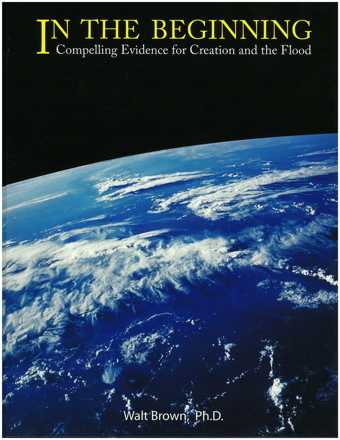 * Interview-Based Review of Flood Models: Jane Albright interviewed 16 creation scientists and leaders for this project. Another 17 declined to be interviewed. Now, Real Science Radio co-host Bob Enyart interviews Albright, a working professional engineer formerly with the U.S. Navy nuclear engineering program, on her resulting articles about the most prominent flood models. * Help Bob Identify Scientists & Engineers Supporting HPT: Please email Bob@rsr.org if you are a scientist or an engineer (or you can tell us of one) supporting Dr. Brown's Hydroplate Theory! 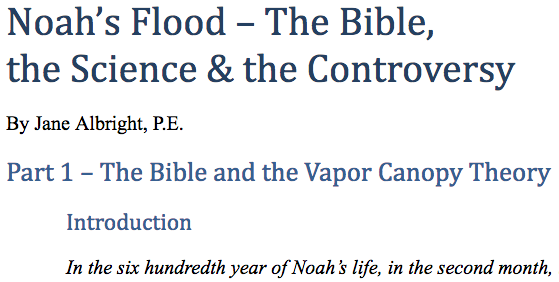 * Higher Oxygen Levels, Greater Air Pressure, the Vapor Canopy, and HPT: A major argument for the vapor canopy has been the evidence that the pre-flood atmosphere had greater air pressure and a higher oxygen content. Hydroplate Theory events may explain even better than the Canopy Theory why oxygen levels were lower after the flood. The HPT's eruption of the fountains ejected into space a significant percent of the preflood atmosphere immediately lowering atmospheric pressure and oxygen levels. So the first HPT factor was that some of the air that stood immediately above the globe-encircling crack was carried into space by the erupting fountains. The second HPT factor is an effect that operates even today, gravitationally keeping atmospheric levels lower as compared to the antediluvian world. The debris ejected from the Earth impacted the Moon (mostly the near side), Mercury, Venus, Mars, etc. and comprises the solar system's meteorites, asteroids, comets, irregular moons, and trans-Neptunian objects (TNOs). The loss of all this water and debris reduced by a couple percent the mass of the Earth. Less mass means less gravity and that means that less oxygen is held down in Earth's biosphere, with a higher percent of our atmosphere's oxygen at a higher elevation out of reach of our flora and fauna. * Decrease in Human (and other) Lifespans: Another major argument for the vapor canopy has been the longer lifespans of the antediluvians, of people and of other organisms. Hydroplate Theory events may explain even better than the Canopy Theory why people, plants, animals, and insects may not live as long today as they did prior to the flood. Since the flood the Earth's crust has been loaded with radioactive (unstable) elements. Radioactive decay is dangerous to biological organisms for it not only degrades the functionality of the overall genome of an entire species but it can also harm each individual. For today, multiple mutations occur with every single cell division, trillions of times over within, for example, a human body. See rsr.org/radioactivity and rsr.org/uranium for an introduction to the Hydroplate Theory's explanation for the origin of Earth's radioactivity. * Vapor Canopy Theory Visibility Problem: Every gas, at a given pressure and temperature, has an "optical depth" which measures how far or how much light can pass into a gas at a given pressure and temperature. Moses wrote in Genesis that God put, "lights in the firmament of the heavens to give light on the earth." So at night, star light had to pass through Earth's entire atmosphere. Yet consider how much water a vapor canopy would need to hold to allow it contribute a significant amount to the flooding of the entire Earth. Claiming that much water could be suspended in such a canopy is to claim almost infinite optical depth for water vapor. However, the thicker and denser the gas, the smaller its optical depth, that is, the less light can pass through it. A gas would have to be completely transparent to have infinite optical depth, and that's simply not the case for water vapor, or for any gas. In 1874 Isaac Newton Vail, who believed the Bible to be mythological, introduced the canopy theory and early supporters included Jehovah Witness founder Charles T. Russell. The early modern creationists widely popularized but later dropped this idea, primarly after Dr. Walt Brown publicized the biblical and physical evidence against it. The Bible mentions first the "fountains of the great deep" (some of which fell down as rain) yet after the first 40 days, the waters continued to rise on the Earth for another 110 days until they covered the mountains. This shows that indeed the primary source for the floodwaters came from below. Also, U.S. Air Force atmospheric simulation software confirmed what Dr. Brown had warned was obvious, that such a canopy would turn the Earth into an impossibly hot terarium, even with only enough vapor to fall as just two inches of rain. So, the early creationists were claiming, against physics and without need, a vapor canopy that would be nearly infinitely transparent. All material attenuates light to some degree. Matter (atoms and molecules) scatter, absorb, and reflect light. No material is perfectly transparent. And that should be obvious to everyone.